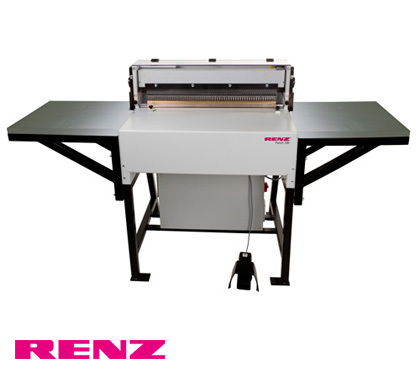 The Renz Punch 700 is a wide format, heavy-duty, professional, floor standing punch machine. A very versatile machine for all types of book and calendar punching production. The Punch 700 can easily be operated by a foot switch or micro switch, while sitting or standing. Punching dies for wire comb binding, plastic and spiral binding are available in QSA execution (QSA quick size adjustment = quick cancellation of punch pins). Due to the wide punching width, 2 part dies can be used allowing punching of books and calendars. The machine can be configured with two 13.77" dies side by side; one in 3:1 pitch and one in 2:1 pitch therefore negating the need to die change when moving between pitches. - Punching dies for all types of ring wire, plastic comb, coil, calendars and custom dies are available. - Side tables for improving product workflow and output. - Optional 2-part split dies for book and calendar work. - Half dies allow for no die change i.e. 3:1 on the left side and 2:1 on the right side. - QSA (Quick Size Adjustment) for high flexibility of different paper formats. - Wide format punching up to 0.16" in thickness of mixed stocks. - Horizontal paper feeding for easy product loading. Size: 76.8" W x 30.3" D x 44.9" H / Weight: 715 lbs.